CBSS Page 3 - Snoopy And The Gang! 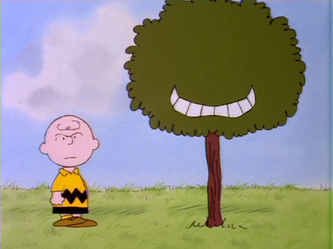 Kite Eating Tree - Charlie Brown gets fed up with the Kite Eating Tree and yells at it. He then goes to Lucy, thinking he's crazy for talking to a tree. 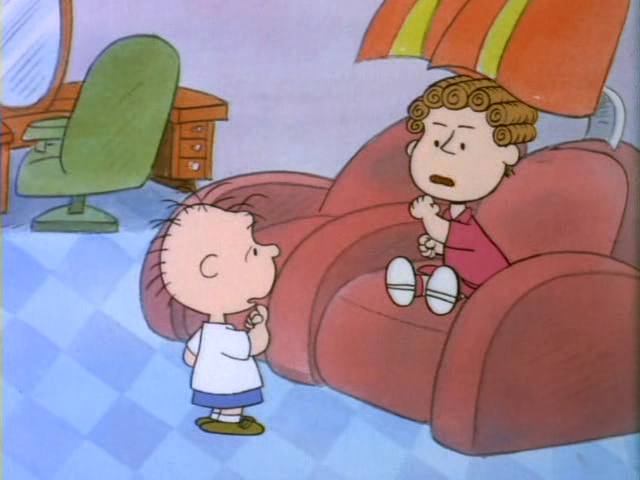 She doesn't believe there's any such thing, and suggests he fly the kite higher. 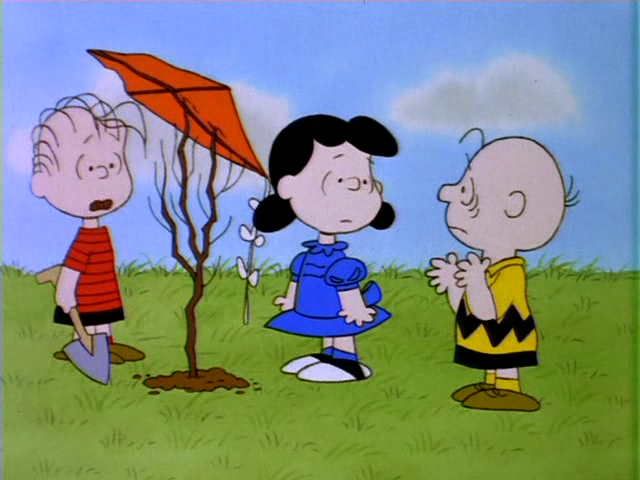 He tries, and the kite eats it anyway, so he threatens not to fly any more kites. 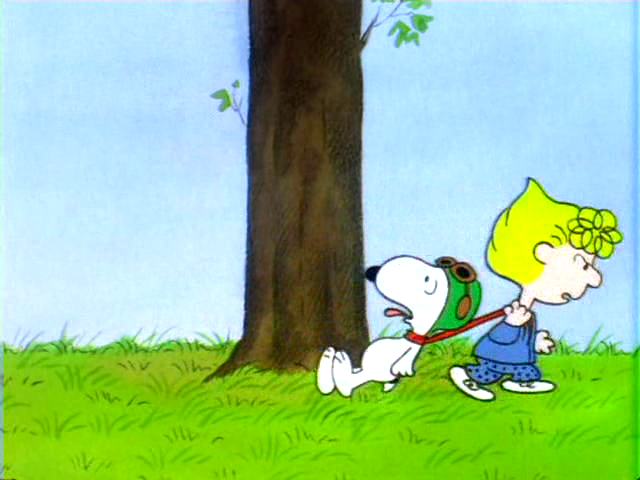 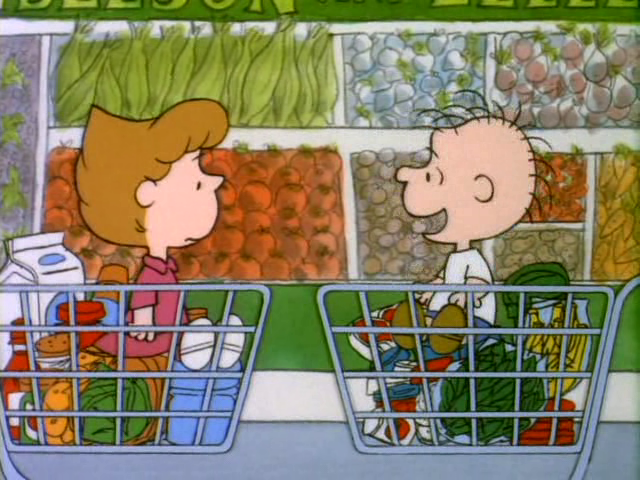 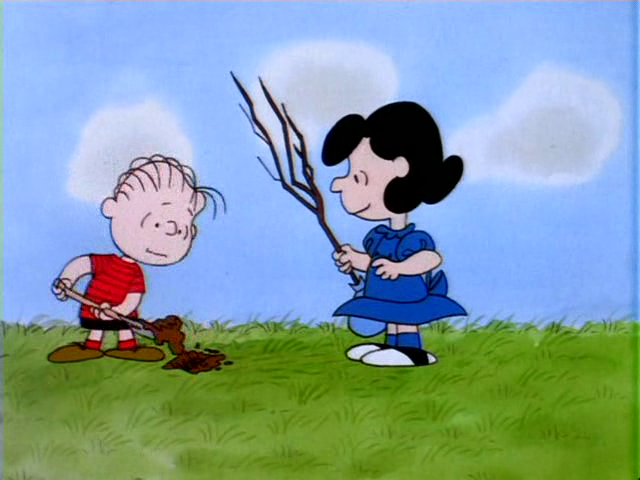 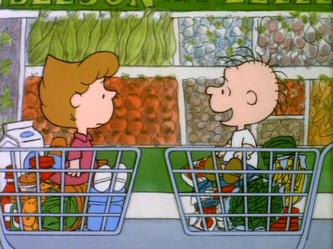 Meanwhile, Lucy and Linus plant a tree. Right after they do, Charlie Brown's kite lands on it. 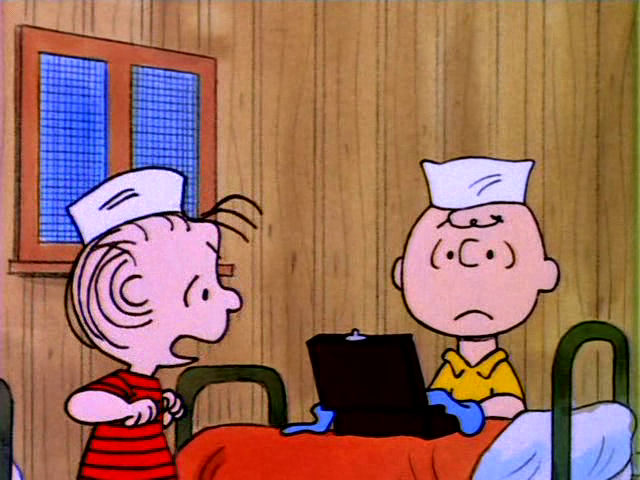 Sally - Sally is up early, finishing a report for school. 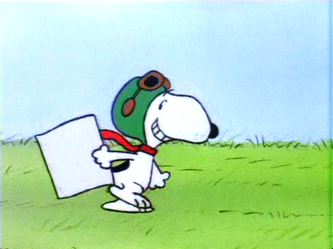 Snoopy, as the Flying Ace, steals her report. 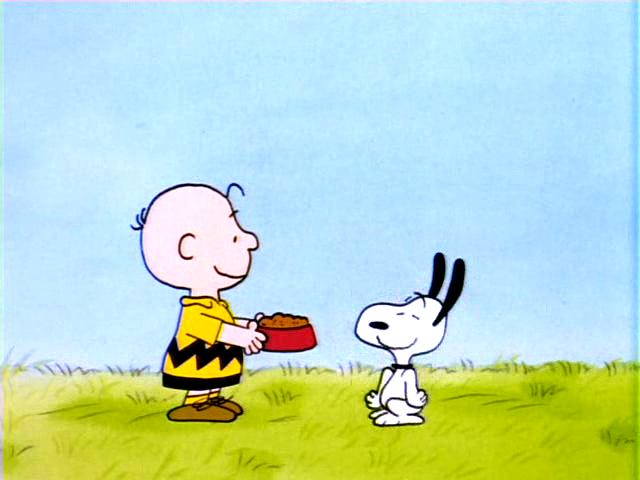 He then eats it. She drags him to school in an attempt to salvage the report. Camp - The gang is off to camp. Linus is afraid of gulley cats who bite people on the arm. That night, he wonders why parents send kids to camp who really don't want to go. 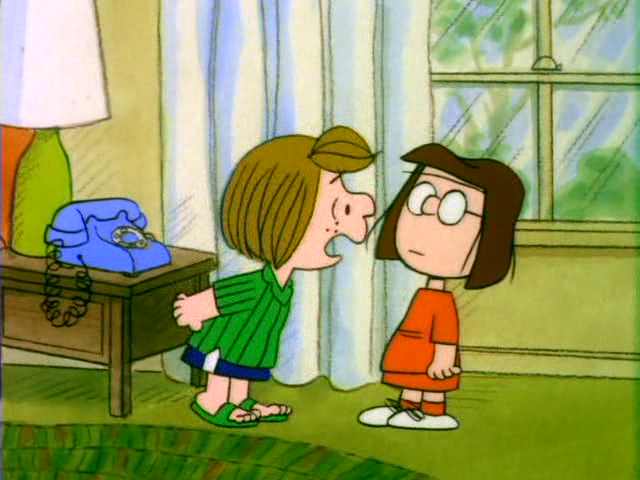 Marcie and Peppermint Patty also go to camp. 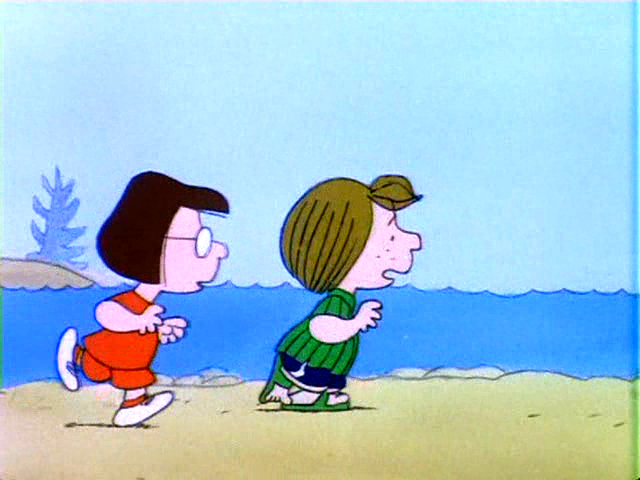 They go across the lake to see Chuck. 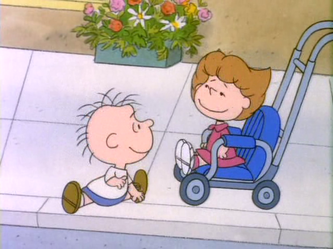 During the trip, they argue over whether Patty is in love with Chuck. 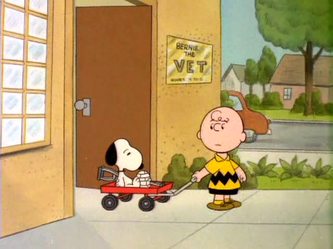 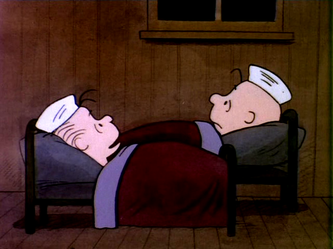 Charlie Brown is sent home because the counselor hears about something happening at the girl's camp, and his name is mentioned. 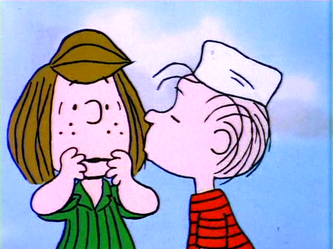 Patty feels bad about what happened, and she feels she'll never measure up to the Little Red-Haired Girl, so Linus kisses her on the cheek. 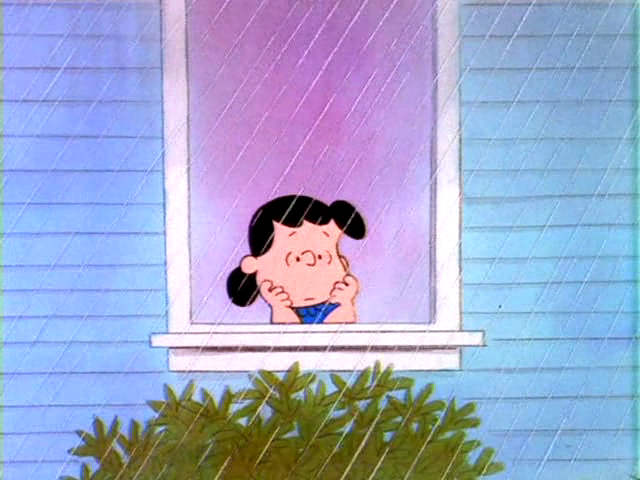 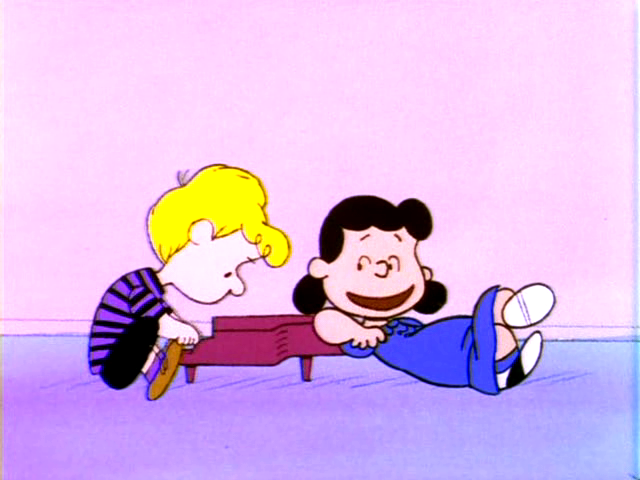 Lucy Loves Schroeder - Lucy spends a rainy day flirting with Schroeder. She then goes home and calls him, and he tries to avoid her once again. 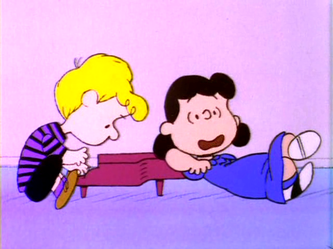 She tries to tell him they are over, but it doesn't work. 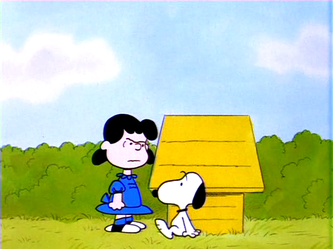 She then confuses her house with his. 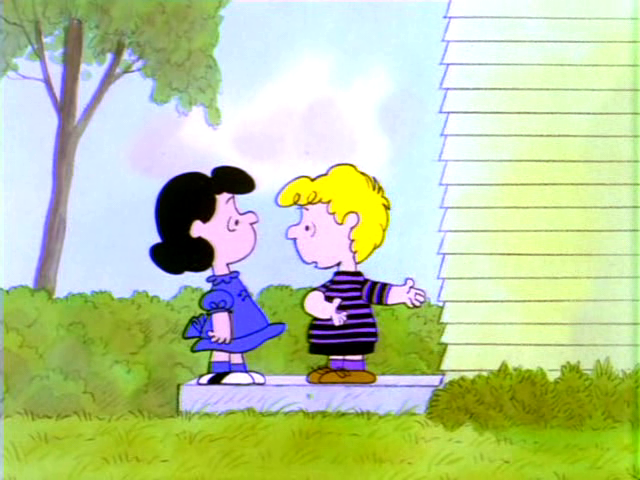 At one point, she demands that he kisses and hugs her. When he doesn't, She storms off. 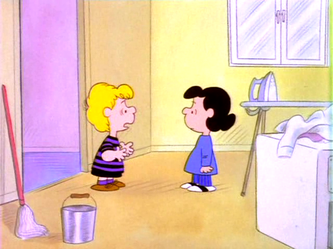 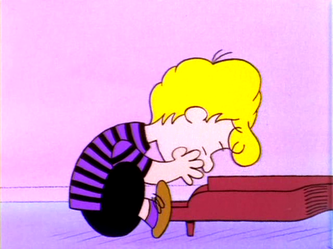 A bit later, she washes Schroeder's piano, in the washing machine! 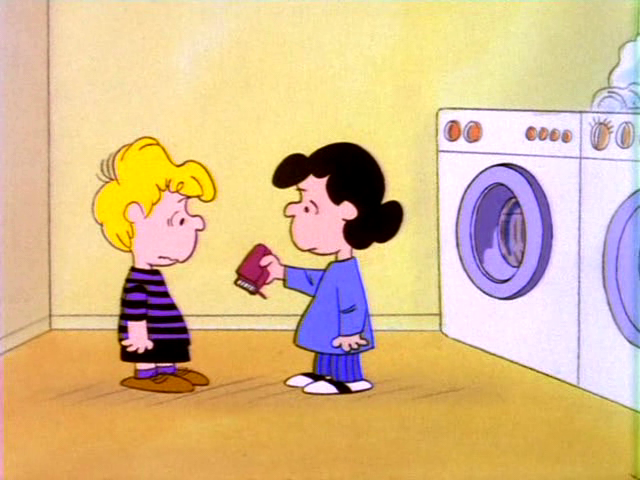 When she dries it, it shrinks. 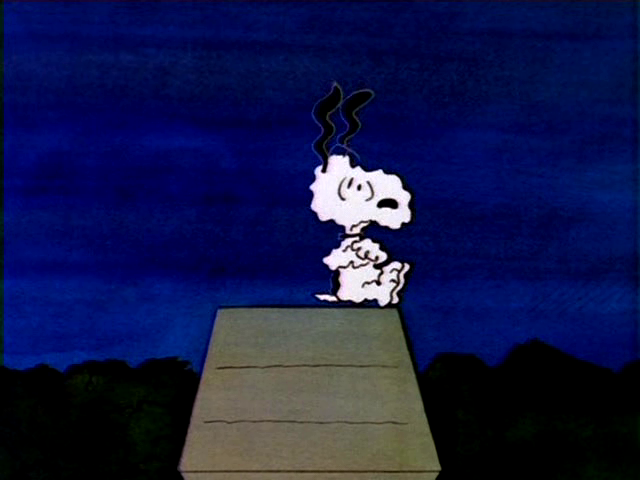 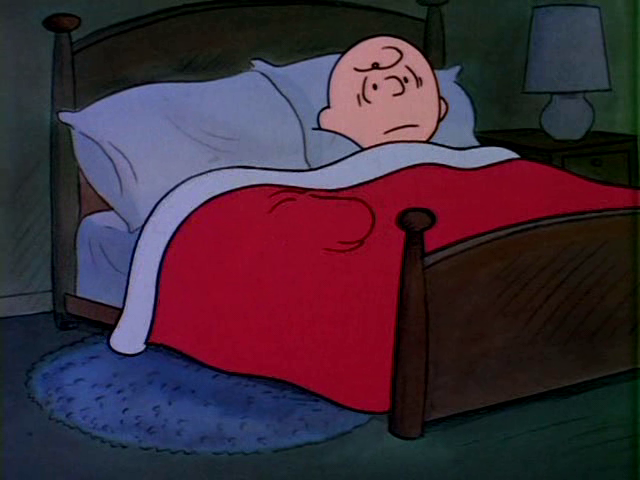 Scared Snoopy - Snoopy is afraid of night noises, so he runs inside to Charlie Brown's bed. 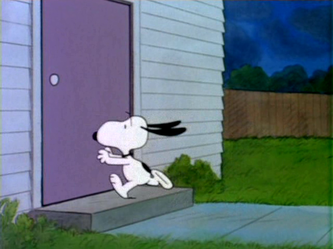 He sends Snoopy back outside. He can't help being scared, so he comes back in. 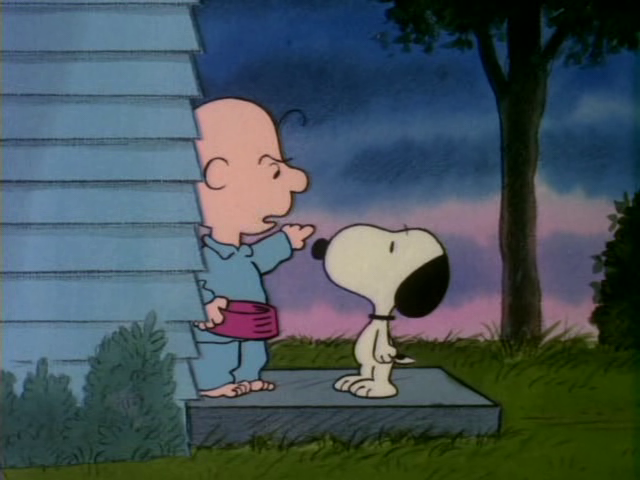 Charlie Brown lays down the law the next day. But, he goes out to stay with Snoopy. 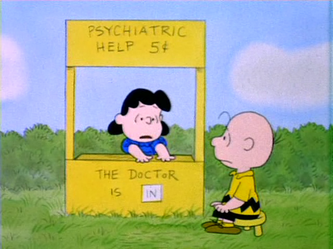 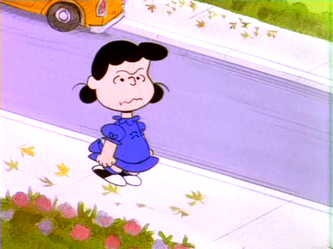 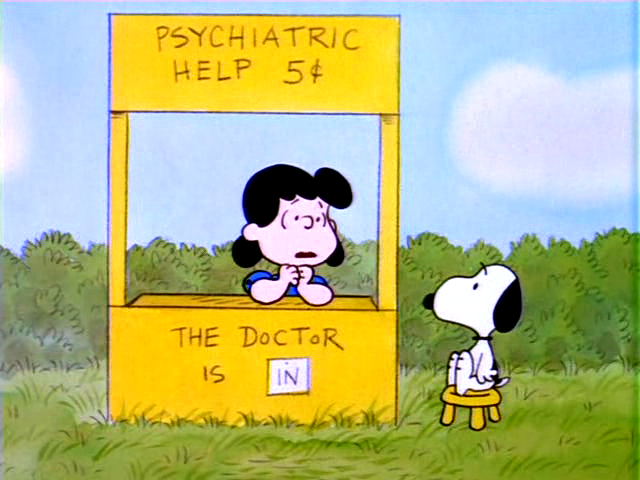 So he consults Lucy. 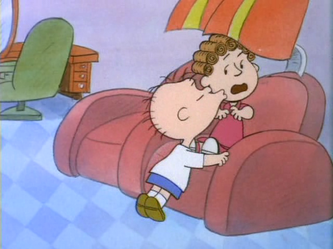 She tries to help him, but he falls asleep. She wakes him up, and proceeds to help him with his fear. 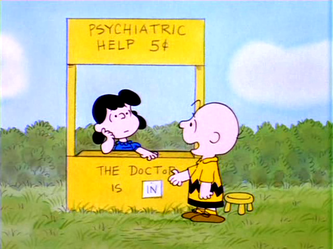 She then demands a 20 cent payment for her services. She takes his supper until he pays. 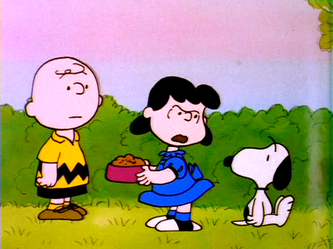 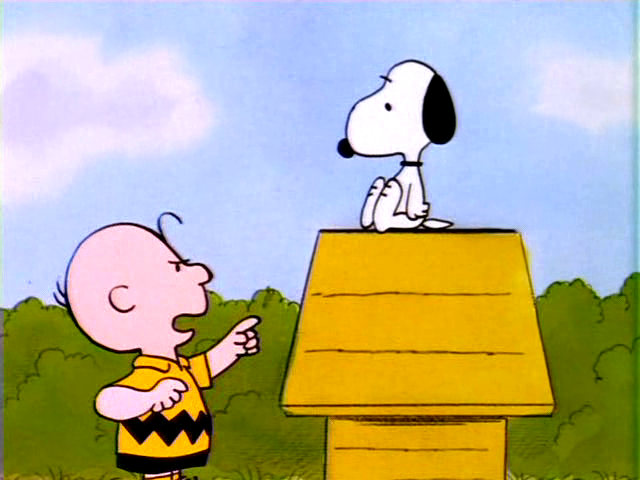 Charlie Brown pays the bill for Snoopy. 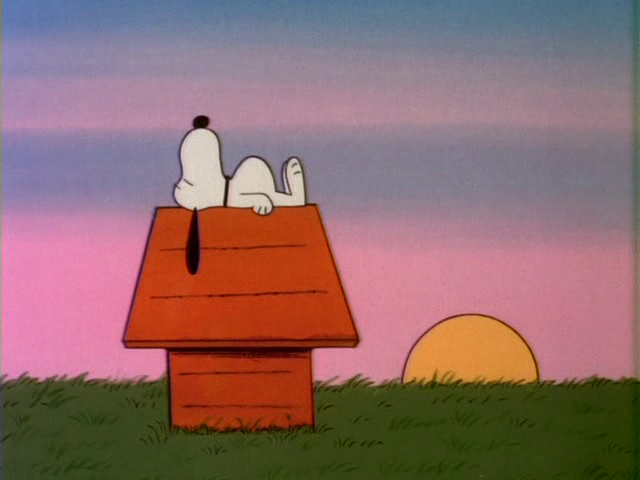 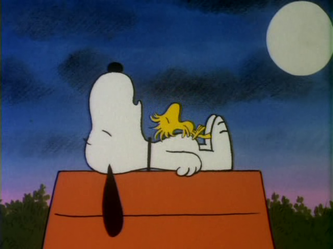 Snoopy's Foot - Snoopy and Woodstock are sleeping. 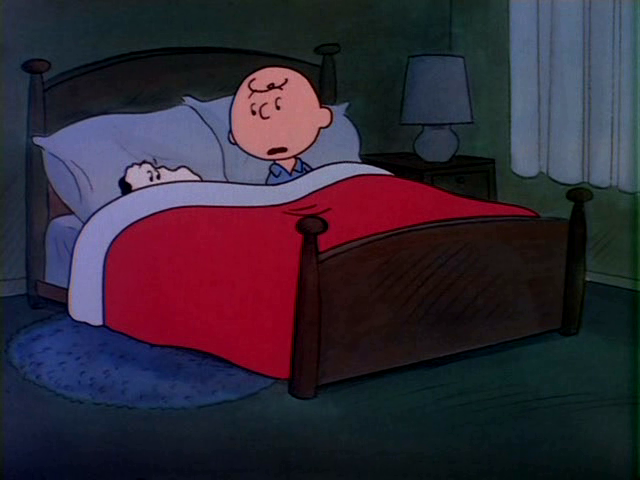 His stomach starts growling, so he wakes up. 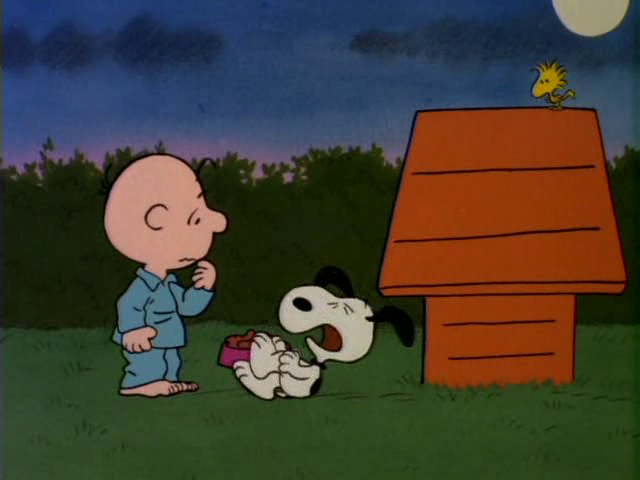 He then wakes up Charlie Brown and asks for food. 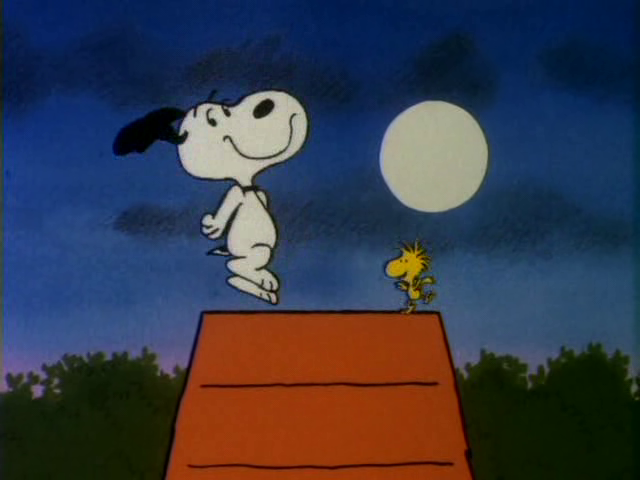 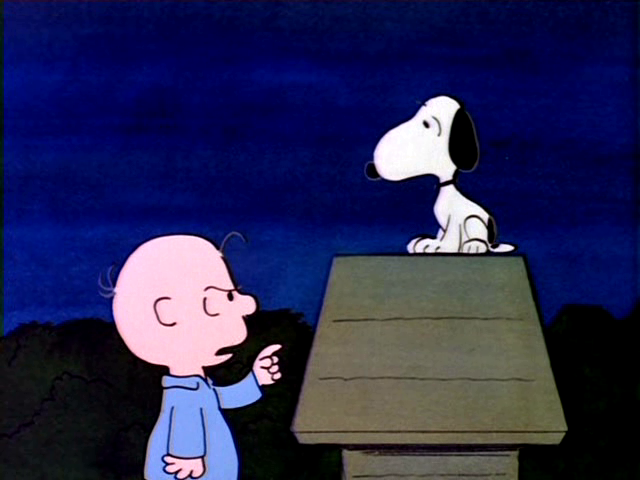 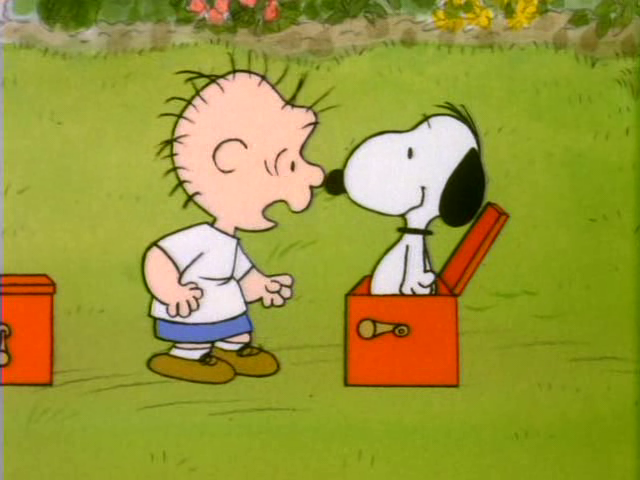 In Snoopy's excitement before getting fed, he falls off his doghouse and hurts his leg. 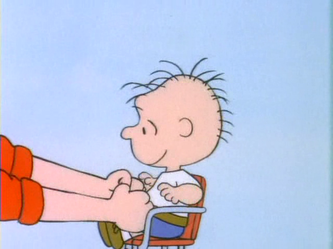 He is put in a cast for awhile. 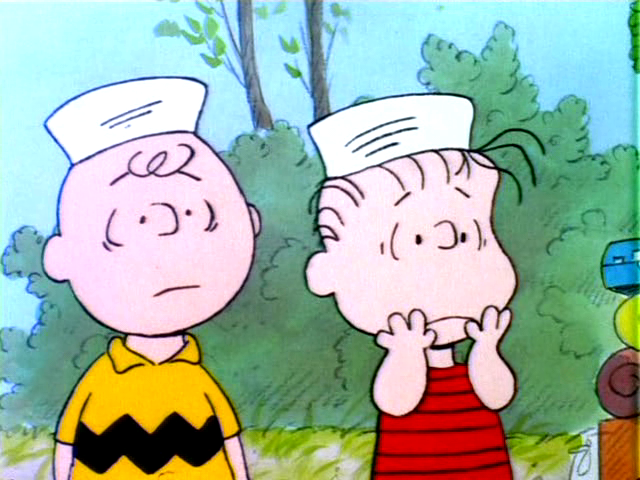 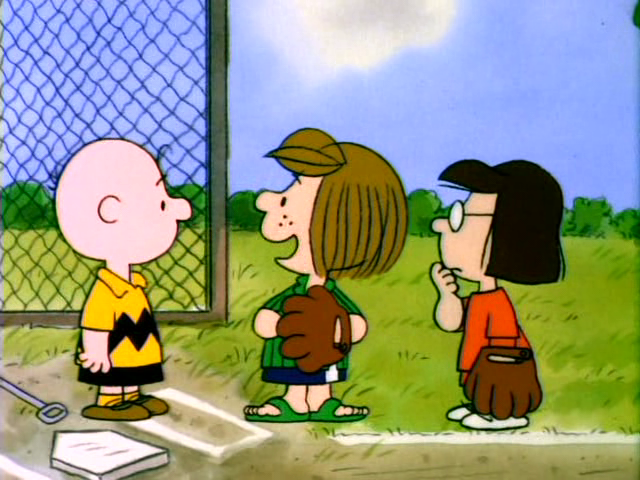 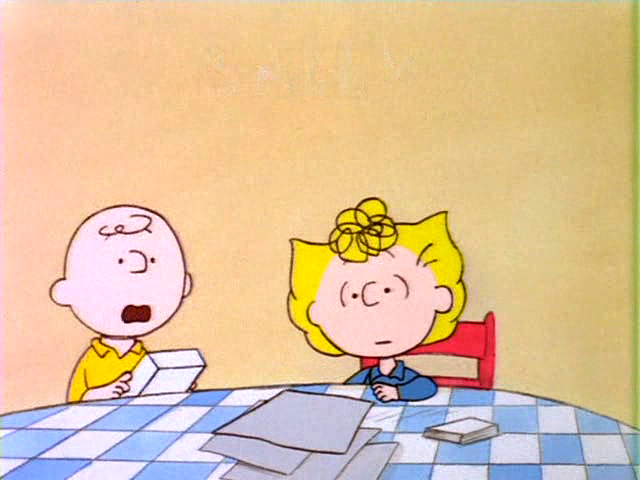 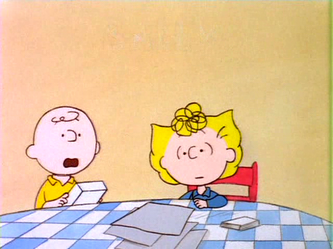 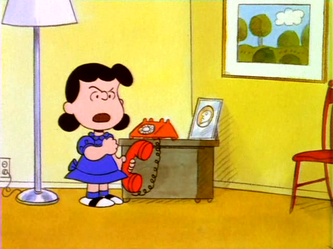 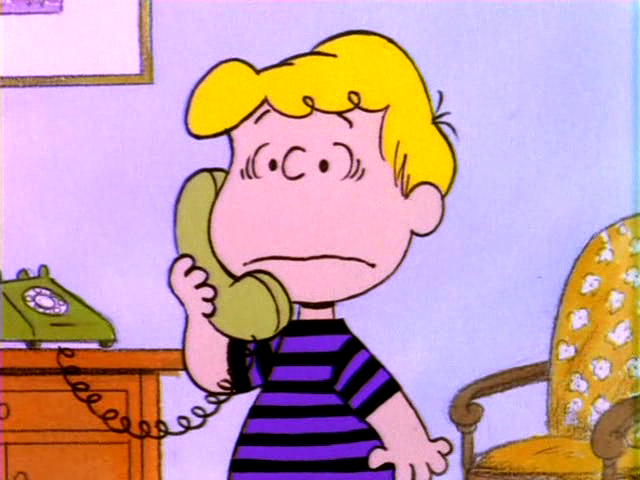 Charlie Brown calls Peppermint Patty to borrow a player for a baseball game. 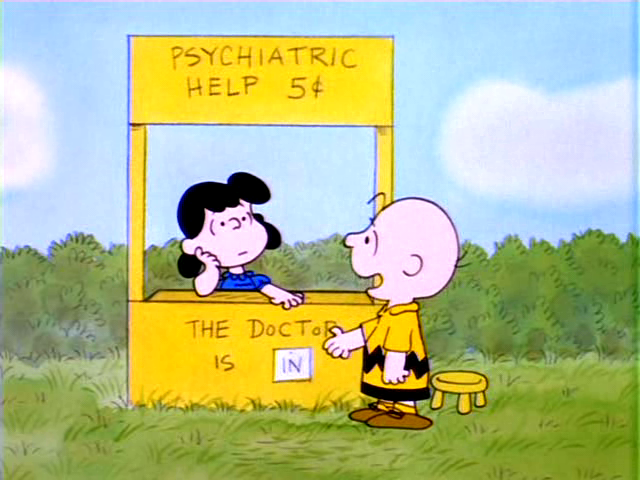 She asks for one in exchange. 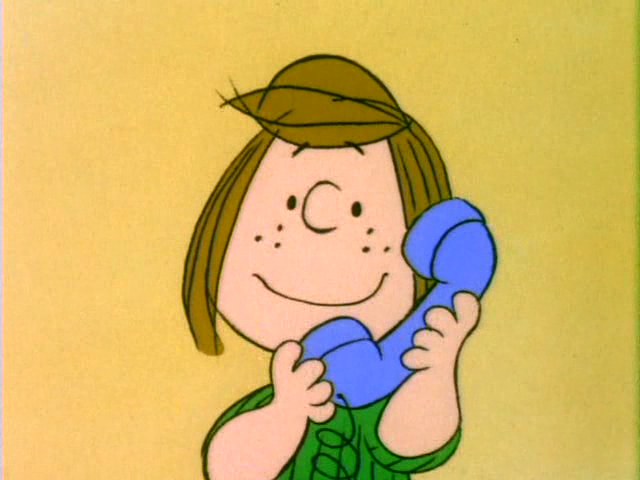 Three guesses who she asks for. 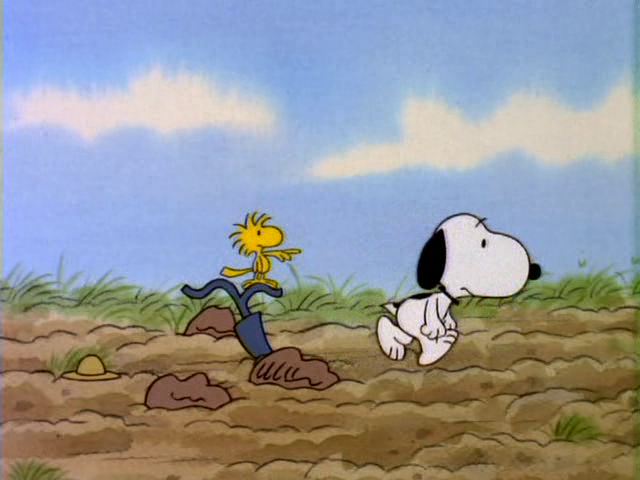 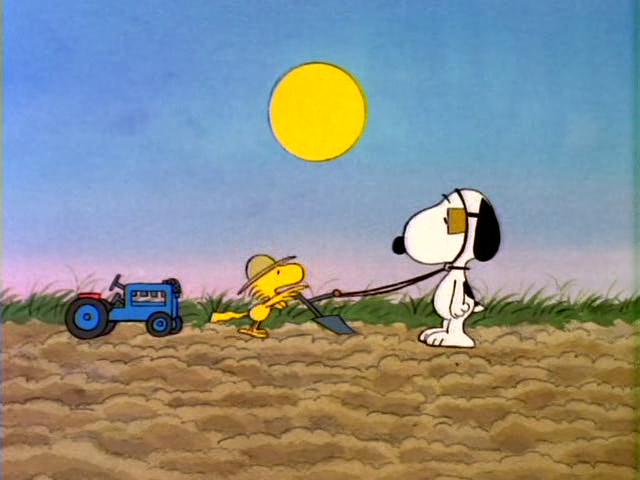 Giant - Snoopy helps Woodstock with his farming. 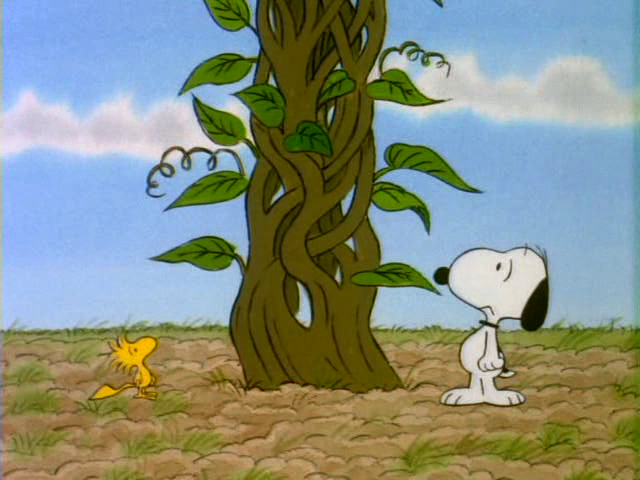 Overnight, a huge beanstalk grows. 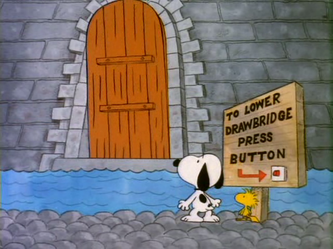 They decide to climb up, and they find a castle. Upon entering, they find a room filled with cookies. 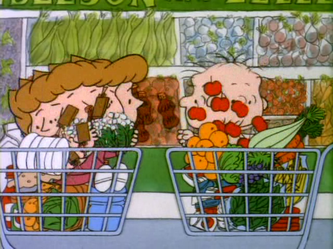 They eat, and are immediately spotted by a giant. 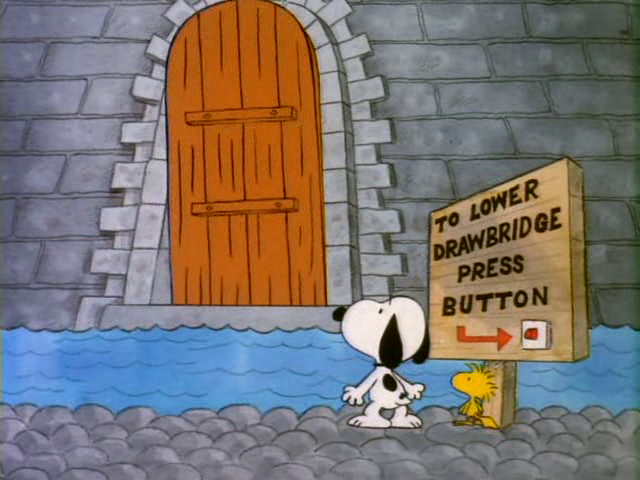 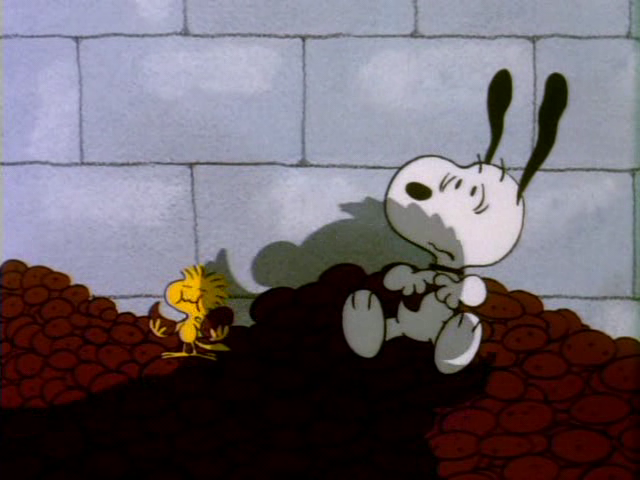 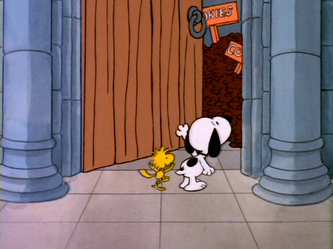 The giant kidnaps Woodstock, and Snoopy has to rescue him. 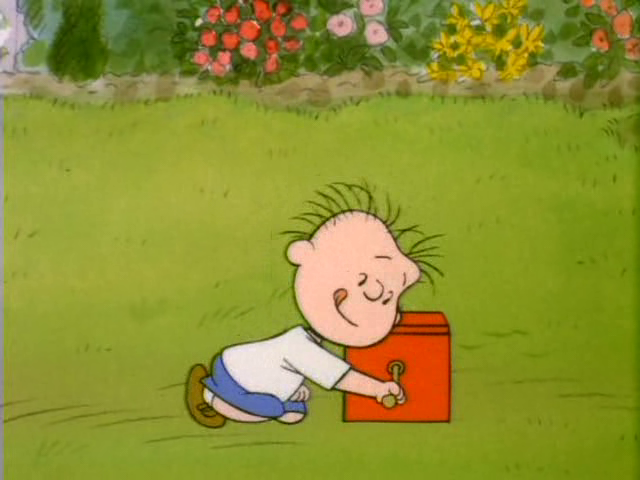 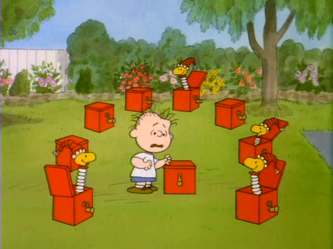 Rerun - Rerun is playing with a jack-in-the-box. 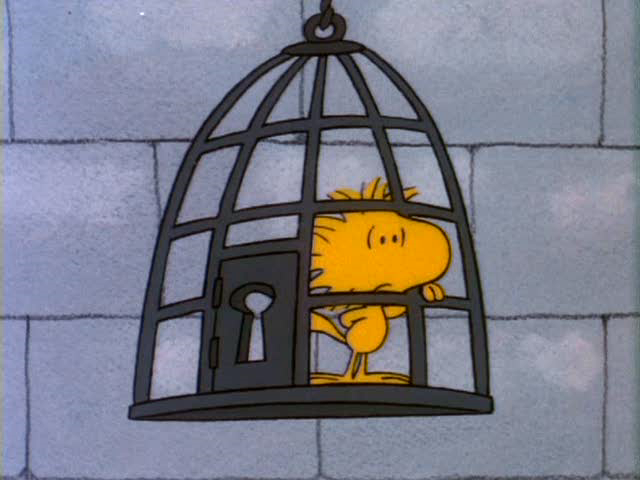 He doesn't quite understand the concept. The jack-in-the-box is more like a Woodstock in the box. 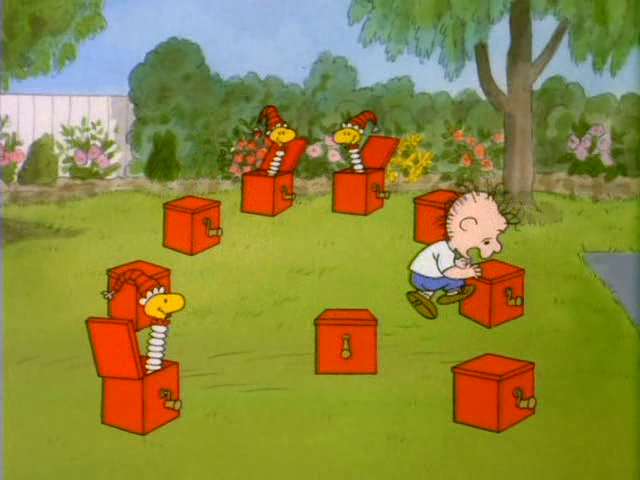 (How he ends up with multiple boxes, I'll never know.) 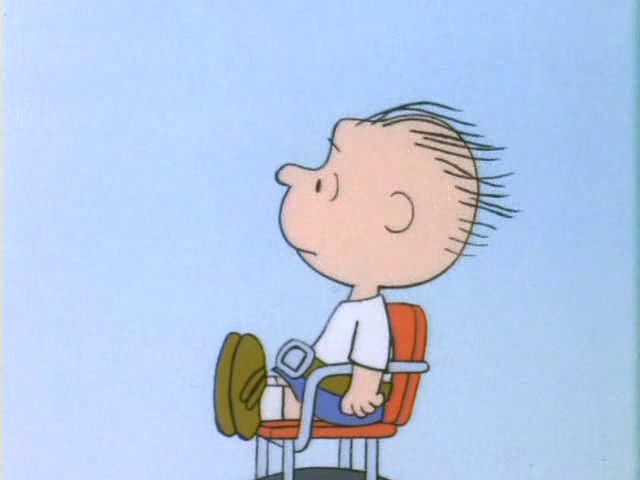 Then, he takes a ride on the back of his mom's bike. 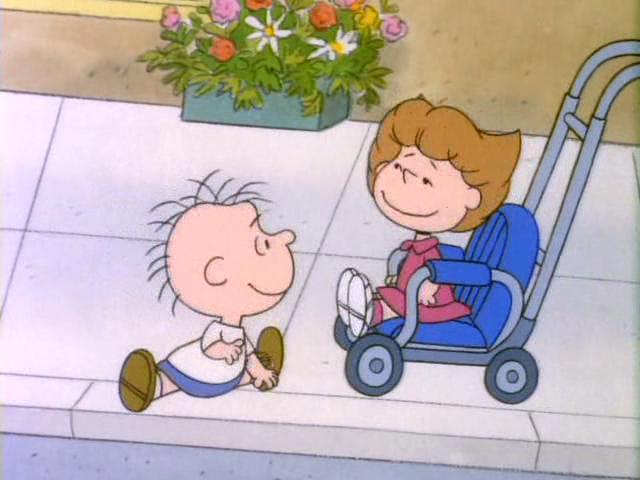 When she gets a flat tire, she puts him on the sidewalk while she fixes it. There, he meets a girl and has his first short-lived romance, and kiss, while traveling with Mom during her outing.